Investors understand that the Federal Reserve’s ongoing purchase of U.S. Treasuries in the open market, known as quantitative easing two (QE2), injects newly created money into the U.S. financial system and economy, but the actual means by which newly created money monetizes U.S. government debt, stimulates the U.S. economy and flows into the U.S. stock market are involved. Proponents of QE2, namely Ben Shalom Bernanke, Ph.D., Chairman of the Federal Reserve, deny that the Federal Reserve is monetizing U.S. government debt and claim that QE2 promotes price stability, stimulates economic growth and helps to create jobs. Critics charge that QE2 is causing price inflation in the U.S. and abroad, as well as a currency war. 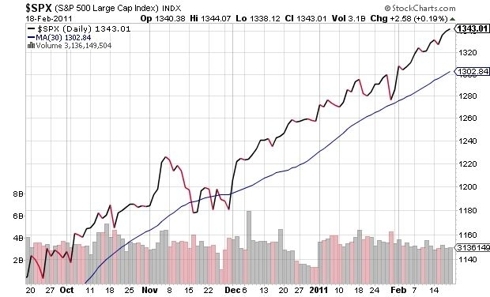 Given the amount of debt owed by the U.S. federal government, as well as by U.S. states and municipalities, investors are, understandably, liquidating U.S. Treasuries and other government bonds and buying equities and commodities, thus, supporting the U.S. stock market rally and driving commodity prices higher. The Federal Reserve’s purchase of U.S. Treasuries is amplifying the U.S. stock market rally and absorbing the U.S. federal government’s debt. The effect of QE on the U.S. Stock market is, to a large extent, accidental, i.e., an unintended consequence. The primary goal of QE2, which is widely misunderstood, is to rebalance the broad money supply with economic activity and debt levels in the U.S. economy, but the Federal Reserve has little control over the flow of funds from QE2. Understanding QE2 requires a basic knowledge of fractional reserve banking and economics. In an economic recession, the broad money supply contracts and underlying economic activity declines. In a shrinking economy, borrowers come under increasing pressure as money becomes less available and may default on loans, destroying the financial assets of banks, which are loans, and causing banks to fail, which is deflationary. In effect, carrying debt becomes more expensive when money is scarce. Since bank deposits are leveraged through loans, when banks fail, the effects are similar to an old fashioned run on a bank. In a fractional reserve banking system, banks loan out much more money than they have on deposit and when borrowers default, banks may have insufficient capital to cover their liabilities, i.e., their deposits. When banks fail, money in the financial system—on the books of banks—is literally destroyed leaving less money available. In other words, the money supply mathematically shrinks, which is the literal meaning of the word deflation. Setting aside the fact that a shrinking money supply tends to cause prices to fall, when less money is available in the economy, interest rates, which reflect the cost of borrowing money, tend to rise as a function of supply and demand. Since borrowing is the engine of money creation in a fractional reserve banking system, rising interest rates exacerbate declines in economic activity, which is the reason why the Federal Reserve cuts interest rates during recessions. If debt levels in the economy are excessive, debt service can drain money from the economy faster than money can be created through new borrowing and a deflationary spiral can result. 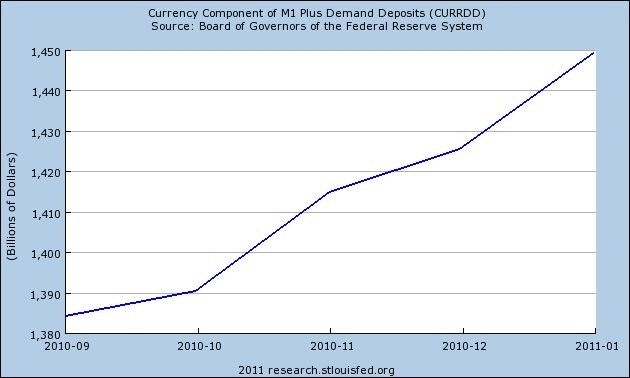 Specifically, a contracting money supply triggered by bank failures, e.g., linked to excessive leverage and financial speculation on the part of banks, results in an increase in defaults while debt service creates a net drain of money from the economy, leading to more bank failures and to a further contraction of the money supply, and so forth. Setting aside the inherently inflationary, cyclical and ultimately unstable nature of the fractional reserve system, if left unchecked, a deflationary spiral will end in an economic depression. Normally, bad debts are liquidated in a recession and banks are allowed to fail, but that changed in 2008. To prevent the failure of the largest banks, and to head off a deflationary spiral, the Federal Reserve began injecting newly created money into the U.S. financial system and is continuing to do so via QE2. Banks were bailed out in 2008 and the value of their assets was preserved, at least on paper, thus debt levels were largely maintained while the U.S. economy and money supply contracted. In the absence of sufficient new borrowing to maintain the money supply, debt service began to drain money from the broad U.S. economy, threatening to plunge the U.S. into a depression. Since the U.S. dollar, which is a Federal Reserve bank note, is a debt instrument created through the execution of loan contracts, it is logical, at least from a macroeconomic perspective, to alleviate the excessive debt levels in the economy by creating additional money that has no corresponding debt. Obviously, when the Federal Reserve writes a proverbial check, the funds are not debited against any account but, instead, money is created ex nihilo. This is the ultimate reason for QE2. QE2 is an attempt to rebalance the broad money supply and, eventually, economic activity levels with debt levels, otherwise there would be many more loan defaults, banks would fail and both the money supply and the U.S. economy would contract further. It would be equally fair to say that QE2 is currency debasement, which will reduce the real value of debt. As a scholar of the Great Depression, Bernanke certainly knows that a new, and perhaps greater, depression has been averted only temporarily and has only been held at bay by the Federal Reserve’s printing press. This is the key to understanding Bernanke’s famous helicopter speech. The problem, of course, is finding an exit from money printing before the currency collapses. It follows that QE2 (or QE3, etc.) cannot and will not stop until the broad money supply, i.e., money circulating in the real economy rather than locked in the financial system, along with the level of economic activity, come approximately back in line with debt levels. 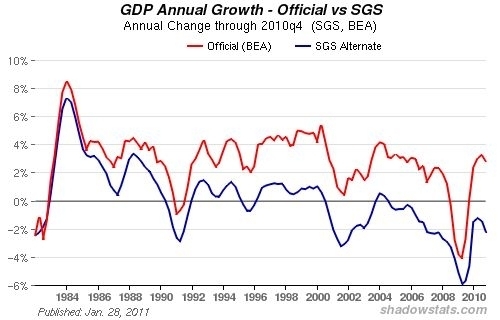 As guideposts, self sustaining GDP growth, absent radical government deficit spending, should be apparent and unemployment levels should be coming down steadily before stopping QE2. Critics of QE2, although they may be correct regarding its unintended consequences, often do not seem to understand the gravity of the situation in terms of debt levels versus economic activity and the money supply, i.e., they underestimate the risks associated with deflation. With respect to unintended consequences, the Federal Reserve has no way to make newly created money flow into sectors of the economy where they can be effective in achieving specific goals such as job creation. In other words, Bernanke is pushing on a proverbial string. 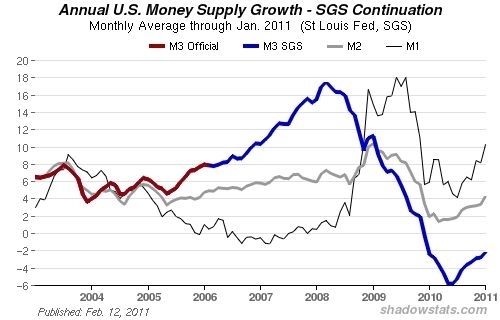 Thus, one valid criticism of QE2 is that money seems to be flowing everywhere except where it most needs to go. Amplifying the rebound of the U.S. stock market into a rally that is not adequately supported by economic fundamentals is merely a byproduct of QE2 and excessive government debt, i.e. investors seeking an exit from U.S. Treasuries and other government bonds. Similarly, the debasement of the U.S. dollar is unavoidable, thus rising prices for imported goods in the U.S., disruptive inflows of U.S. dollars into foreign economies, and rising global commodity prices will persist as long as QE2 continues. By the same token, precious metals prices, i.e., silver, gold, platinum and palladium (each of which has an ISO 4217 currency code), will not only continue to rise but, the longer QE2 continues, the more investment demand for precious metals will grow. Primary Dealers, e.g., Goldman Sachs & Co. and JP Morgan Securities, Inc., purchase Treasuries in the open market and when holders of U.S. Treasuries sell them to the Primary Dealers as a consequence of QE2, they receive cash. Primary Dealers buying Treasuries on behalf of the Federal Reserve sell them to the Federal Reserve in exchange for newly created money, thus money is injected at the level of investors that sell Treasuries to the Primary Dealers. QE2 effectively destroys Treasuries, i.e., it removes them from the marketplace to the balance sheet of the Federal Reserve, replacing them with cash at a rate of roughly $2.5 billion per day. 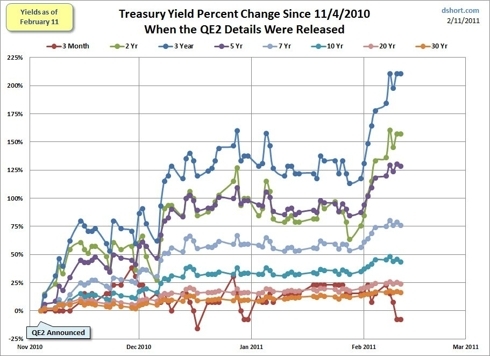 However, Treasury purchases by the Federal Reserve are not taking place at a rate faster than the U.S. Treasury issues new debt, thus, the effect of QE2 is to slow the rate at which the supply of Treasuries in the market increases. Theoretically, this should hold Treasury yields down, but QE2 has not been entirely effective as a means of keeping the borrowing costs of the U.S. federal government down. 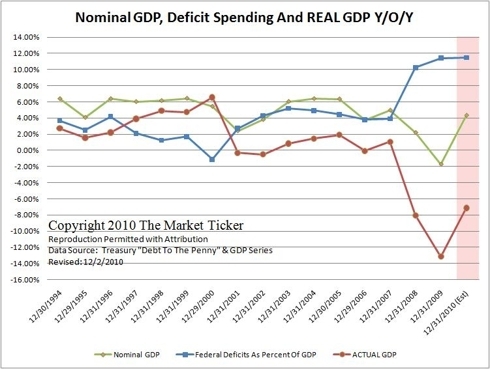 Chart courtesy of Doug Short, Ph.D.
Another effect of QE2 is to distort the distribution of money over the U.S. economy. As the Federal Reserve creates new money, it flows into the financial system and creates the false appearance of a transfer of money from the broad U.S. economy to financial markets, i.e., from so called Main Street to Wall Street. In fact what is happening is that excessive debt levels in the U.S. economy are causing a net drain of money from the broad U.S. economy, versus normal money creation through lending. 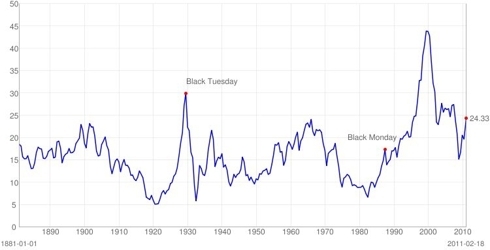 In other words, monetary deflation over the whole economy is being offset by monetary inflation in financial markets. Direct bidders, e.g., domestic funds and depository institutions, Primary Dealers, as well as foreign investors, participate in U.S. Treasury auctions. Some Treasuries are held to maturity at which time investors receive cash, but the money paid by the U.S. Treasury for Treasuries held to maturity is derived from new borrowing. 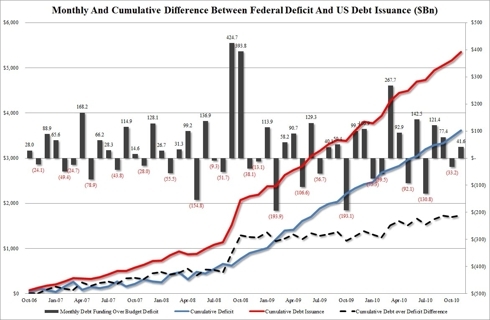 The total of all new Treasuries to be issued in fiscal year 2011 has been estimated to be $2.25 trillion in net debt, which is more than $800 billion more than the U.S. federal budget deficit. As a result of QE2, overall systemic liquidity is increased, thus investors have more cash than they would otherwise have, and the cash they have, either literally or in effect, has been newly created. 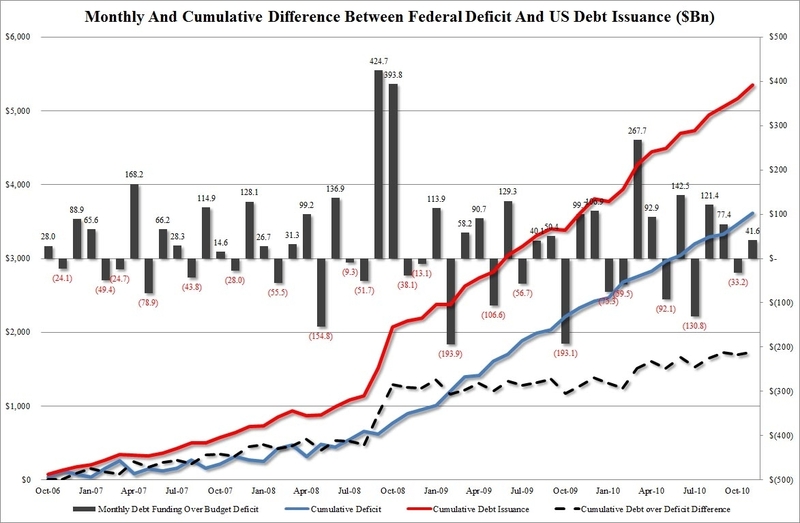 Of course, funds can also flow into the U.S. Treasury and out again as federal government deficit spending, i.e., government debt can be monetized by the Federal Reserve through transactions intermediated by the Primary Dealers and through multiple other parties that purchase new Treasury debt with funds derived from QE2. In any case, QE2 represents an increased but artificial demand for U.S. Treasuries which, directly or indirectly, helps to fund the U.S. federal government’s deficit spending, and deficit spending temporarily, stimulates the economy. Without auditing the Federal Reserve and its Primary Dealers, it is not possible to determine the complete flow of funds or the sums of money involved in all transactions resulting from QE2, aside from the announced rate of U.S. Treasury purchases of $75 billion per month. As newly created money, through successive transactions, circulates further from the point of injection, both the flow of funds and causal relationships become less clear. Closer to the point of injection, however, either the data are known or a higher confidence level is possible. An outsider analysis of the QE2 flow of funds devolves into (1) known transactions, where the exact sums of money involved in particular transactions may or may not be known, followed by (2) deducible transactions, i.e., transactions that must logically occur but where the sums of money involved are unknown, and (3) a variety of transactions that are possible but that may or may not occur (no probabilities are assumed) and where any sums of money that might be involved are also unknown. 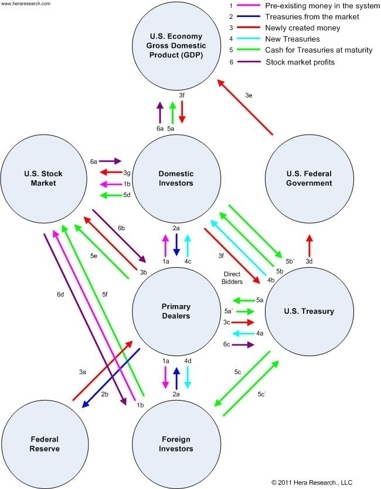 Given these limitations, there appear to be no less than seven ways that funds created through QE2 can flow into the U.S. stock market assuming the minimal possible number of transactions so as to remain as close as possible to the point of injection. When the Primary Dealers buy U.S. Treasuries in the open market on behalf of the Federal Reserve, they either use funds from the Federal Reserve or pre-existing money [1a] to make purchases, and then sell the Treasuries they acquire [2a] to the Federal Reserve, receiving newly created money [3a]. Between U.S. Treasury auctions, the Primary Dealers could invest the new funds in the stock market [3b], liquidating these investments or taking profits [6b] only as needed to make further U.S. Treasury purchases from investors. U.S. Treasuries are sold at auction to a combination of the Federal Reserve’s Primary Dealers [4a], which re-sell Treasuries to domestic investors [4c] and foreign [4d] investors, and to direct bidders to the U.S. Treasury [4b]. As the Primary Dealers purchase Treasuries in the open market their capital is replaced by new money from the Federal Reserve. In theory, Primary Dealers that purchase new Treasuries at auction could, in effect, if not literally, use newly created money to do so [3c and 6c]. Treasuries sold at auction by the U.S. Treasury [4a, 4b] not only cover current U.S. federal government deficit spending but also roll over debt for Treasuries reaching maturity, thus generating profits for investors, i.e., profits from Treasuries reaching maturity represent additional, newly created money in the hands of investors [5a ,5b, 5c]. Newly created money also flows from the U.S. Treasury to the Primary Dealers [5a] and, directly or indirectly (through Primary Dealers), to both domestic [5b] and foreign investors [5c]. Treasuries reaching maturity, i.e., U.S. government debt that is being rolled over, represent an estimated $800 billion or more annually, above and beyond the U.S. federal government’s budget deficit, which is currently $1.5 trillion. 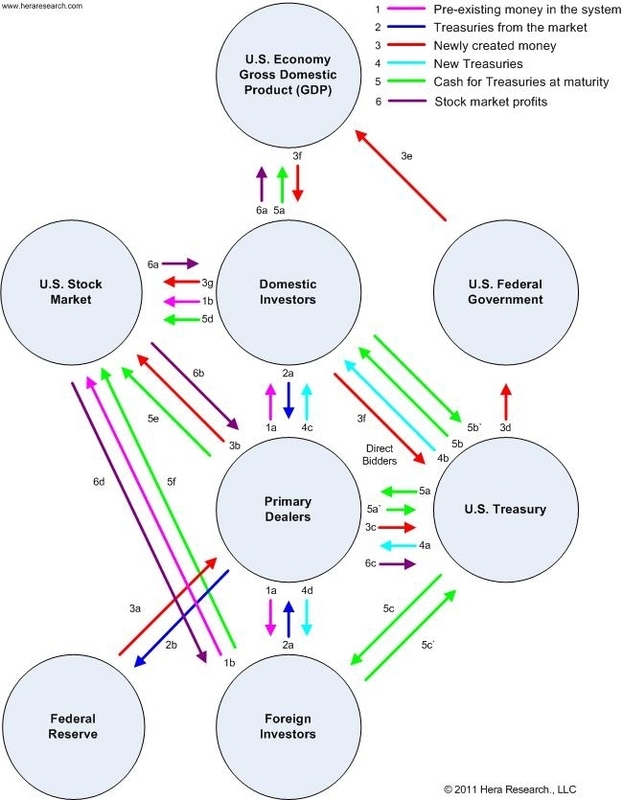 Both profits from Treasuries held to maturity and interest payments could flow into the U.S. stock market [5d, 5e, 5f], back into U.S. Treasuries [5a`, 5b`, 5c`], or elsewhere, e.g., into emerging markets, commodities, etc. When the U.S. federal government spends borrowed money into the U.S. economy [3d], it supports government employee salaries, payments to government contractors, etc. Money spent into the U.S. economy becomes part of the Gross Domestic Product (GDP) and contributes to U.S. economic growth statistics. Pension funds and individual retail investors [3f, 3g] can invest money derived from U.S. federal government deficit spending in the U.S. stock market, in US Treasuries, etc. Finally, as the U.S. stock market rises, profits flow back to investors [6a, 6b, 6d] which can then be recycled in myriad forms of investment or spending. One can imagine the financial system as a hydraulic system where increasing pressure will affect the whole system but it’s not precisely a closed system thus the pressure falls off with distance from its source. Ideally, increased spending on the part of investors taking profits would create a wealth effect where money would trickle down through the economy and stimulate economic activity. Unfortunately, the majority of U.S. financial assets are held by a relatively small percentage of the population, which makes it difficult to substitute investor trickle down for reduced consumer spending. Since the start of QE2, the rate of increase in some of the major U.S. stock market indices is similar to that of the Federal Reserve’s M1 monetary aggregate over the same interval. 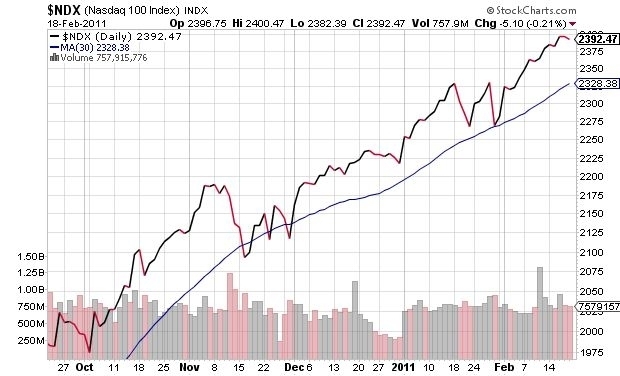 The evidence suggests that increased liquidity, flowing from QE2, is amplifying, and perhaps manufacturing, the U.S. stock market rally. 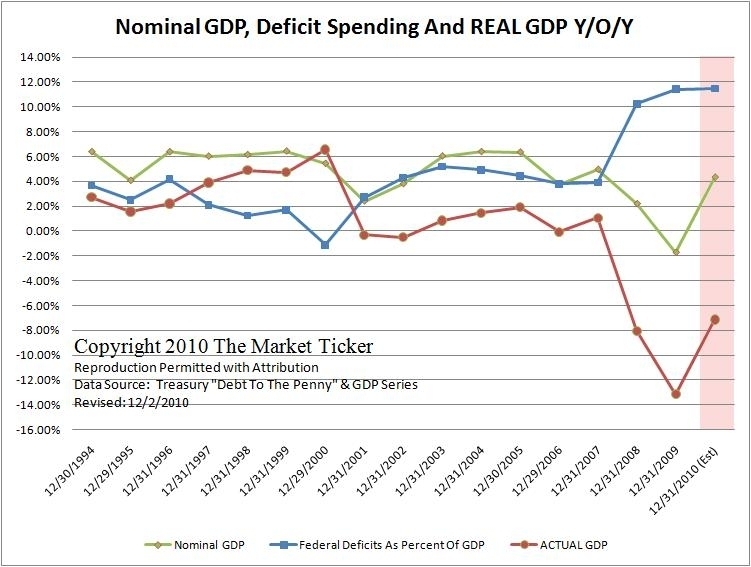 U.S. federal government deficit spending represents a $1.5 trillion component of U.S. GDP, which is approximately 10%, while U.S economic growth remains anemic and unemployment remains high. At the same time, annual U.S. federal government borrowing represents approximately 3% of world GDP and willingness to lend to the U.S. federal government is waning. It is, therefore, difficult to see how or when QE2 can be stopped without the U.S. economy either stagnating or tipping back into recession, or without the U.S. federal government becoming insolvent pursuant to Treasury auction failures. In contrast to poor economic fundamentals, the S&P 500 P/E ratios are above their historical average by approximately 50%, most probably pointing, if not to an imminent correction, to a decoupling of the U.S. stock market from the broad U.S. economy, reinforcing the view that the current stock market rally is artificially enhanced or largely manufactured. 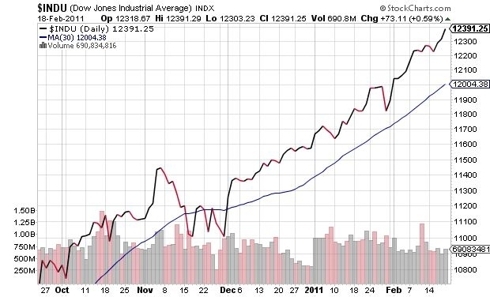 All other things being equal, as long as QE2 continues, the U.S. stock market will most probably remain in an overall rally while the U.S. dollar will continue in an overall decline. Of course, weakness in other currencies can mask the decline of the U.S. dollar and increase exchange rate volatility, but the prices of commodities, as well as precious metals, provide an elucidating standard of comparison. In the long term, QE2 is obviously not a sustainable course. Nonetheless, QE2 can continue as long as (1) the United States remains politically stable, (2) the U.S. dollar remains the world reserve currency and (3) the value of the U.S. dollar strengthens, remains flat or decays in a controlled manner, i.e., at a relatively stable, gradual rate. Although Bernanke clearly believes that the risks are contained, the Federal Reserve’s policies are, in fact, debasing the U.S. dollar and have already guaranteed the end of the U.S. dollar as the world reserve currency. 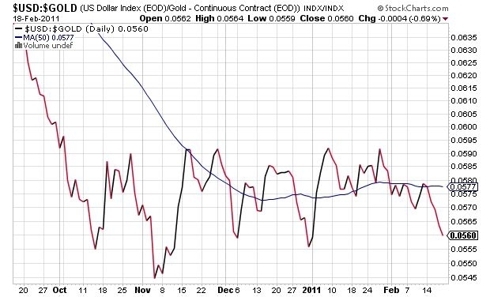 The unintended consequences of QE2 indicate a countdown to the hyperinflationary collapse of the U.S. dollar. In other words, if QE2 is not stopped, the U.S. dollar will eventually fail. The main risk is that (1) a double dip recession in the U.S. that shatters confidence in U.S debt, (2) a rush on the part of domestic or foreign investors to exit U.S. Treasuries, (3) a rapid and widespread rejection of the U.S. dollar abroad, (4) a large, rapid decline in the value the U.S. dollar, regardless of the cause, or (5) runaway price inflation, i.e., cost push inflation, could trigger the collapse of the U.S. dollar. What is important about the risk of a U.S. dollar collapse, is that QE2 escalates all but one of the potential triggers, i.e., QE2 is countering deflation, albeit in a distorted way, thus it is technically preventing a double dip recession, or a depression, in the U.S.